Dingell: My Carbon Tax Bill is "Off the Table"
The carbon tax camp lost a powerful Congressional voice yesterday when Rep. John Dingell announced he was taking “off the table” the hybrid carbon tax proposal he floated last fall that featured a national carbon fee, supplemental increases in taxes on gasoline and aviation fuel, and a reduction in the mortgage interest deduction for super-large houses. The irony, as visitors to this Web site know, is that a revenue-neutral carbon tax would not act as a drag on economic activity, since the return of the tax revenues to Americans via tax-shifting or dividend rebates would fully offset the higher costs of fuels and energy. Indeed, the progressive impact on incomes would make for healthier economic growth, as wealth flowed from the rich to the middle class and the poor. In a 2007 report strongly supporting a U.S. carbon tax, the conservative American Enterprise Institute pointed to the "double dividend" in which "a carbon tax can be paired with a reduction in other taxes in a manner that improves the overall efficiency of the economy." Moreover, because the tax level would be ramped up rather than imposed all at once, any bite from a carbon tax would largely occur during the next upturn in the economic cycle rather than in the current downturn. 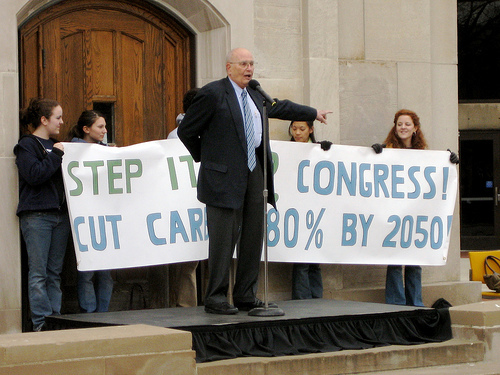 Citing the positive response to his carbon tax poll, Dingell emphasized that “people desperately want action on global warming.” He added, “I will continue to work on a comprehensive climate change bill that will seek to reduce greenhouse gas emissions by 60-80 percent by 2050 and will include a cap-and-trade proposal.” The Hill commented that "policymakers seem intent on avoiding any potential political fallout that could come with a big tax increase and instead favor a cap-and-trade program," omitting the fact that putting a price on carbon — which is central to both carbon taxing and carbon cap-and-trade — means higher energy prices. Despite Dingell’s announcement, the carbon tax movement doesn’t lack for prominent supporters. These include New York City Mayor Michael Bloomberg and former Vice-President Al Gore, along with numerous scientists, economists, pundits, opinion leaders and other current and former public officials. Although Bloomberg was defeated earlier this month in his effort to enact a congestion fee to drive into the Manhattan Central Business District, he has also forcefully made the case for a federal carbon tax in a number of major addresses. Gore continually advocates for revenue-neutral carbon taxing in his public appearances, most recently last month, saying, "Here’s the solution. We need a CO2 tax, revenue-neutral, to replace taxation on employment, which was invented by Bismarck — and some things have changed since the 19th Century." The Carbon Tax Center appreciates Rep. Dingell’s past advocacy for a carbon tax. We regarded Dingell’s hybrid carbon tax as a stroke of near-genius and only regretted that his proposal, along with a phase-out of the mortgage tax deduction for luxury homes, wasn’t supported by the mainstream environmental groups. We were proud to work with Rep. Dingell’s office in analyzing the efficacy of his hybrid carbon tax. Our National Hybrid Carbon Tax Model remains available to anyone wishing to analyze the carbon-reducing and revenue-producing impacts of carbon taxes. Names matter. The Lieberman-Warner cap and trade bill with an auction for permits (advocated by presidential candidates) is certainly a "tax" — it would raise fuel prices and divert funds to government programs (some, no doubt worthy such as energy conservation and renewables). The Carbon Tax Center’s revenue-neutral proposal: to "recycle" the revenue by distributing it to equally to each household and Gore’s suggestion: to use carbon tax revenue to offset payroll taxes both shift tax burdens onto environmentally damaging activity without increasing the total tax burden on the economy. In short: the cap and trade proposals should be described as "CAP, AUCTION, TRADE AND SPEND," and Gore’s suggested revenue neutral-carbon tax should be described as "TAX CARBON BURNING INSTEAD OF WAGE EARNING." Once we’ve got the names right, maybe we can have a fair debate. The candidates are disingenuous. They have about as much interest in truly helping the auto industry as they do in drafting fuel economy or climate change legislation that’s comprehensive. If their interest in those things were real, they would have supported U.S. Rep. John Dingell’s comprehensive carbon tax proposal that he floated last year in which he promoted a gas tax and carbon fee for all industries. The put-up-or-shut-up nature of the Dearborn Democrat’s proposal was dismissed by most because it had real costs. Dingell dropped the proposal Tuesday because, he said, his constituents couldn’t afford it. Whether that’s the real reason remains to be seen, but one thing’s for sure, the plan had teeth — something lacking from all the pandering today. Well, here we go: one more way to further disadvantage U.S. businesses. Do you seriously think China’s going to do something similar? You’re right: trade effects are huge. To answer your question: YES, China would have strong incentives to enact a carbon fee if the US did. If the Chinese matched us, we’d no longer have reason to “carbon” their exports to us. (“Double taxation” is prohibited by trade agreements.) By enacting their own tax, China would capture the revenue that the US had been getting on goods exported to the US without suffering any trade disadvantage. Capturing that revenue stream is a big incentive for our trade partners to enact their own carbon taxes. A carbon tax is much easier to internationalize than “cap and trade” or regulation. See “Beyond Kyoto: A tax-based system for the global reduction of greenhouse gas emissions” by Dr. James Kahn of Washington & Lee U., published in Ecological Economics. Click here. By the way, China has rejected a carbon “cap” as has India. And a “cap” WOULD create trade disadvantages for countries that enacted it compared to those that did not. Mr. Handley: Your argument favoring carbon taxes, that taxing the carbon footprint of imports, up to the amount of US taxation, blows away objections (to carbon taxes) based on the purported trade disadvantage. However, I do not know how carbon-use efficiencies, or lack of them, would be handled: in basic steel production, for example, different processes differ in carbon-intensity, and within a given process there can be a wide range of carbon intensity, the higher carbon intensities tending to vary directly with capital intensity. School picnic for pettifogging sea-lawyers, quite contrary to how carbon taxes should work. Correction: Dr. Kahn’s paper on an international carbon tax system is here. I also recommend Dr. Rob Shapiro’s paper. And yes, David, ideally the system would be fine-tuned; low-carbon processes and products were taxed less. Presumably, manufacturers and importers would have opportunities to point out instances where their products were more efficiently made and to request appropriate tax reductions. I think it might be best if this issue was framed as a tax shift, and just get rid of the whole notion that it’s a new tax, or a carbon tax. If you mention anything to do with a new tax it seems many people (and politicians) just tune out, or worse. I would start discussions on this issue as, "I think we should reduce income and payroll taxes – and solve climate change…" I wonder if taxshift.com is available. The word tax is an immediately turn off for many people as it should be, as politicians are always looking for sources of revenue. At least payroll taxes are not hidden and should help keep some groups from feeding at the federal trough, think hidden ethanol tax subsidy. My dictionary says a tax is to fund government. Why not make it an assessment that cannot be used to fund government and must be returned equally to all tax filer. If this were done all federal energy subsidies and mandates, that are also inefficient, would be unnecessary.